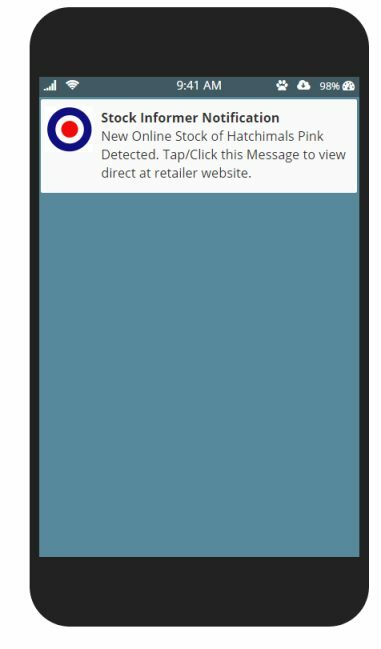 A few of you have been asking where our App is for sending instant stock notifications? Well, unfortunately due to personal circumstances it's been delayed. A Push Notification on a Android mobile device is a message that instantly flashes up (just like other app messages you probably receive). It's similar on a desktop PC/MAC but flashes up in the bottom right corner of your screen. You can then Tap/Click the message to be taken directly to the retailer website. Like the email notifications, please do not rely on this service to find you stock. We will send Push Notifications on a case by case basis where we can. It is pointless us sending thousands of notifications if a retailer only has a few units of stock which get snapped up almost immediately. Just leads to further frustration. To get started you need to be registered and logged into the Stock Informer website and then click the 'My Profile' link at the top of the webpage. See section 2 and read all the notes. The bottom of section 2 you should see a YES/NO button. Flip the button below to 'YES' to start receiving notifications (obviously flip to 'NO' to stop!) If you cannot see the button, then it’s likely your browser/device is not currently compatible (apologies iPhone/iPad users!) You will also need to accept any pop messages your browser may display for you to give permission. Remember to click the 'Save Changes' button at the bottom of the page to save your preferences. That's it! To receive notifications on numerous different devices then you will have to flip the On/Off button on each one. Once you have your product, you can stop future notifications from annoying you by flipping the button back to the 'No' position. Also, your browser will have settings that can block future notifications from us. This service is completely free to all registered Stock Informer users.